Soak chickpeas in water for about 8-9 hours. Skip this if you can are using canned beans. Drain the water and add onion, parsley, coriander, garlic, cumin powder, salt, pepper and blend it well. Add flour and mix it well. Add more flour if needed. Take about a tablespoon of mix and make small balls. Prepare all the balls. Take a pan and heat oil. 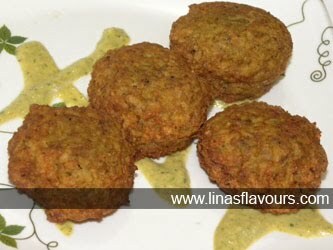 Deep fry falafel in batches till it is light brown. Drain it on paper towel. Serve it immediately with your choice of hummus. You can even make pita pockets with falafel and vegetables and serve.